St. Cyprian of Carthage's (dates not known) 'Testimony' consists of biblical extracts, arranged under various headings to illustrate the passing away of the Old Law and its fulfilment in Christ. This manuscript was written by a northern French or Breton scribe, but was in England by the mid-10th century, when additions were made, and it was catalogued in the library at Worcester Cathedral in the early 17th century. Here the text starts with its first line written in ornamental display capitals. Erasures are visible: the last three words originally all ended with an 'S'. 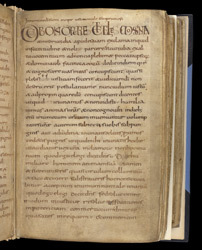 The ink, but not necessarily the scribe, change noticeably in the 5th and 14th lines of the text.